CAPS meetings around here used to be great experiences that were dedicated to making our neighborhood better. We wish they would go back to that format. Unfortunately, as tomorrow night's CAPS meeting approaches, we have a sneaking suspicion that there may be attempts by the CAPS officers and white shirted/gold starred police officers to discredit our blog and our reports rather than agree that there's a problem and work with us toward solutions. 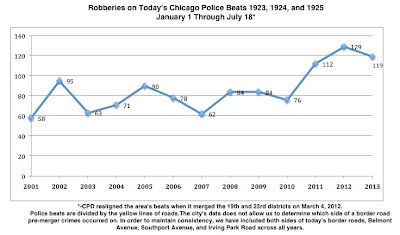 First, this: It is a fact that out of Chicago's 274 police beats, Wrigleyville and Boystown's beat 1924 is the #1 beat for robberies in the city of Chicago over the past 90 days; it is the #6 beat for robberies over the past year; it is the #8 beat for violent crime over the past 90 days; and it is the #28 beat for violent crime over the past 365 days. This information is accurate as of 3:00PM on Tuesday, August 6, 2013. 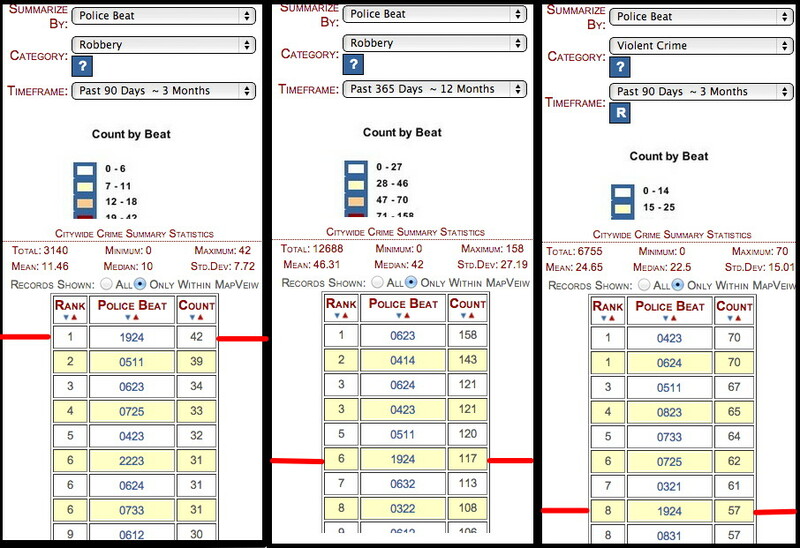 You can navigate your way to the stats page at ChicagoPolice.org. Or click here for a quick link. 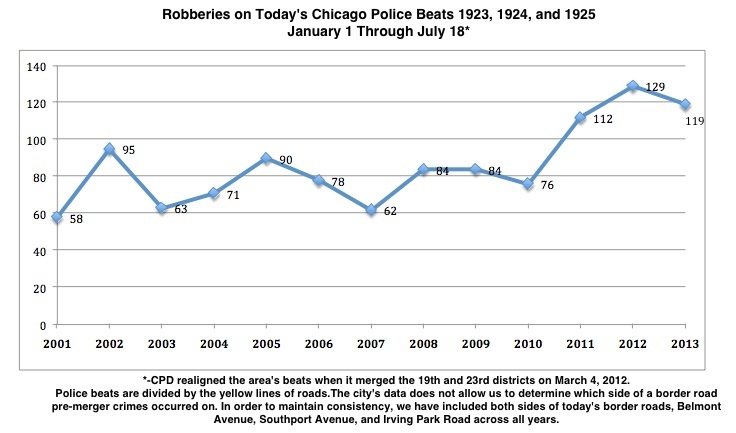 As you can see, the CPD web site says there were 42 robberies in beat 1924 over the past 90 days. Is it wrong? No. It's exactly correct. The Chicago Data Portal lists exactly 42 robberies on beat 1924 over the past 90 days. Here they are. Note that all CPD data is quarantined for a week before it's released online, so the time period covered by the 90 days ended 7 days ago. We have also uploaded a spreadsheet of this data set for exploration and examination. These are facts. Not our opinions. Not our non-existent, top secret devious plan in action. Facts. 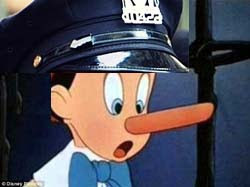 They are facts provided by the same police department that our CAPS officers and police executives are sworn members of. We will not waste time fact-checking the other rankings that are produced by the police department itself. Our crime graphs are generated using data provided by the Chicago Police Department via the City of Chicago Data Portal. 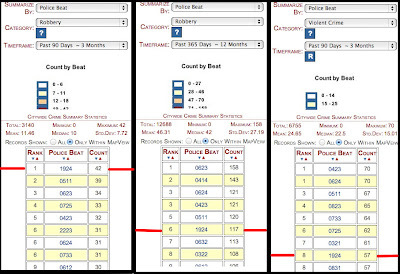 We upload spreadsheets of the raw data for anyone to review, correct, and critique. Ask a CAPS officer about an increase in crimes over the past 90 days and they'll switch the topic to a more favorable period of time. Maybe the last 60 days. Or maybe compare those 90 days to last year's same 90 days. There are a bunch of robberies this month? That's an uptick. The 90-day trend is fine. On and on. Somehow, some way, though, we've upticked our way up up up. It's no longer an uptick. It's a gosh-darned uptock. CAPS officers love to throw out numbers with no data to support them. We provide the numbers and open access to the information for anyone to critique. Open access to information? We're big fans. It's almost crazy that we feel the need to say this. We never, ever make up statistics or stories. Ever. Do we make mistakes? Of course. We also post corrections when people set us straight and we've eaten crow a couple of times. We support our stories with Chicago Police Department case numbers whenever possible. If anyone suggests that our stories are false or wildly incorrect, get specific examples. Then email us or post it anonymously in the comments. We have a reader and a media specialist who are dying, dying to file Freedom Of Information Act requests. We stand by our reports and we post corrections when we learn of errors. Always. Also keep in mind that the Chicago Police Department this year severed ties with two community news outlets, denying reporters access to crime reports. The CPD will not allow you to check their information nor will they provide you with details for examination. They expect you to trust them. Don't. Not when it comes to this. People at these meetings who are supposed to be protecting and informing us also sometimes engage in another activity. They drop little nuggets of false information about people who dare challenge their baloney. It sounds ridiculous, we know. A little right-wing nuttish. Or left-wing nuttish for that matter. A little like we may be typing this in a bunker on Buckingham Place. Except some of them do do that. They usually do this in one-on-one or small group chats after or before meetings. Little things about "those people." We know this happens because, last year, one such CAPS officer dropped a juicy tidbit about one of us in a conversation with - - -wait for it - - - the targeted person's spouse. We affectionately call that CAPS officer the "R-man." Care to guess how the R factors into the story? Fortunately, we haven't seen the R-man lately. Maybe they transferred or got promoted. That's it. There will probably be some other silliness. But the facts are the facts and the facts come directly from the Police Department itself. And our motive/agenda/secret mission is very simple. To inform our neighbors and drive our leaders to take action that will get our neighborhood back to the safe, relatively non-violent neighborhood that we all know and love. Period. If it turns out that we've reached the point that our neighborhood CAPS operation finds itself disputing statistics generated from within its own building, well, we suppose now you understand why the violent robbery problem has gotten to the point that it has. We extend our sincere thanks and appreciation to all of the hard working cops on the street who work to protect us every day and night under trying conditions with little support. You came to our aid when four of us were victimized on the streets of Wrigleyville and Boystown in separate incidents over recent years. You remembered one of us a few weeks after our incident when you saw us on the street. You asked how we were doing. We will never forget what you did for us nor will we ever forget you. Thank you. UPDATE: Added "left wing nuttish" reference for good balance.